The all-new 2017 Ford GT is the “new kid on the block”, the sports car coming with sheer performance and the latest technology inside. Recently, the North American carmaker has released a video, which highlights the car`s 5 Drive modes for the digital cluster. As technology progresses, so thus the auto industry with a whole new range of gizmos and gadgetries inside, which are now part of an integrated system called the digital cluster. The digital cluster consists of a multitude of programs that keep track of the car`s functions, which are all digitalized and kept under control. 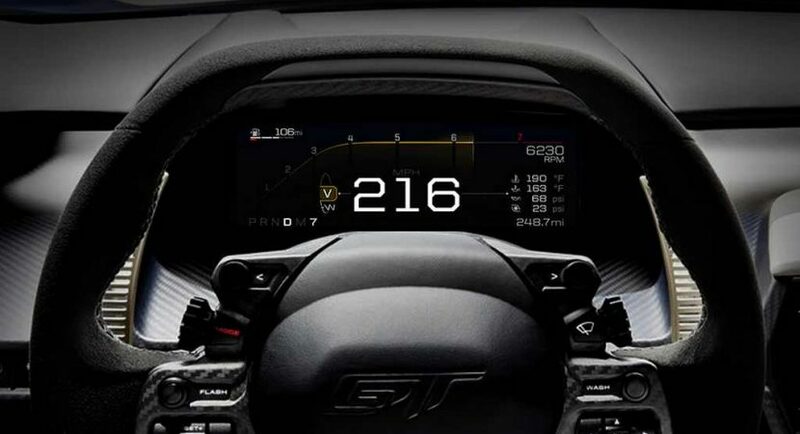 The 2017 Ford GT uses a 10-inch digital gauge cluster now available with five driving modes which ease-up the driver`s comfort and ensures a much safer driving. Please find below complete information of the car`s five driving modes released by motorward.com, as well as the video which best highlights the entire system! Normal mode displays information in a purposeful manner. The theme is simple; the speedometer is centered and bold, gear selection is to the right, fuel and temperature are top left. The hockey-stick-shaped tachometer displays in a compressed scale for lower rpm, as the engine revs so quickly the lower counts mean almost nothing to the driver. The 3,000-to-7,000-rpm range dominates the top of the display. Wet mode carries many of the same information concepts over from normal mode, using a blue theme and a “wet floor” concept. Graphics under the speedometer emulate the shine of wet asphalt to remind the driver of the mode selection. Sport mode adjusts information priorities. Front and centre is gear selection, with the speedometer off to the right and less prominent. It’s displayed in an orange theme and is the preferred mode for most test drivers. Track mode presents a stark combination of black background and highly legible text and graphics, in a crisp, red theme that’s easy for the eye to pick up in a fast-paced environment. Gear selection and engine speed are displayed prominently, while coolant temperature, oil pressure, oil temperature and fuel level – rendered as a percentage rather than miles to empty – are bottom right. V-Max offers an entirely different display – purposeful and pared down. Specifically tailored to pursuing maximum top speed, it displays a large, centered speedometer, with tachometer reduced to just a line with indicator dot for minimal distraction. Coolant temperature, oil pressure, oil temperature and turbocharger boost are displayed to the right, with fuel level displayed top left.